I have been away from my passion of writing for a while and am trying to get it back. In that search, I have come up with 7 ways to do that. Passion and fires have a lot in common. One of the ways to reignite a fire is to lay on some easily burned items. Strips of paper, old love letters, dried flowers. You get the idea. Well, to apply that to writing just write words. Words that come easily. Me, you, the sun. You get the picture. Do it for a while before moving on. On top of the dried flowers, put some kindling. Thin strips of wood or small branches are good. For your writing, put together sentences. You know: I love you. I love to write. The dog barks. Nothing too heavy. Keep it simple. You light the paper and get the kindling started. Writing wise, you string together a couple of sentences that belong together. Maybe make it a couple of strings of sentences. After the kindling is going well, you add a bigger piece of wood, maybe a small branch of very dry wood. In writing, move on to a paragraph of the sentences you have started on. You now have a pretty good fire, but you want to keep it going, so you add a little more kindling to keep the heavier piece of wood burning. In writing, to the sentences you add a few more words, or rearrange them to make a better sentence. Now that the kindling is burning nicely, add another piece of dry, good wood, maybe a little heavier, because now, you have a fire burning well. With your writing, take a look at what you have and maybe rearrange the order of the paragraph to make it make more sense. Or start a story with some of the words you have already written. You have your fire burning, so now all you do is occasionally add more wood to keep it going. With your writing, you just need to keep doing it. Make a goal of so many words a day, not only on what you are working on, but maybe take that goal and start another work while keeping the old fire burning. 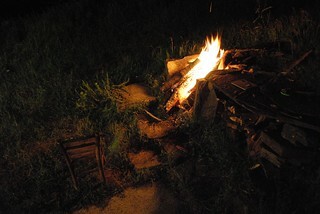 There you have a good fire and a great way back to your writing passion. I am also trying to rekindle my spark. I will try your process and let you know when I have a full, raging conflagration! Will be looking forward to your raging conflagration! Lovely analogy. Had never thought of it like this before but makes sense to me as making a fire is one of the few practical skills I have (learned from my father-in-law). Thank you. Being on fire is such a great symbol for writing. I’m grateful for the many people who keep my fire going, including you. Thank you, Carolyn and I too, am thankful for you and all my firekeepers.